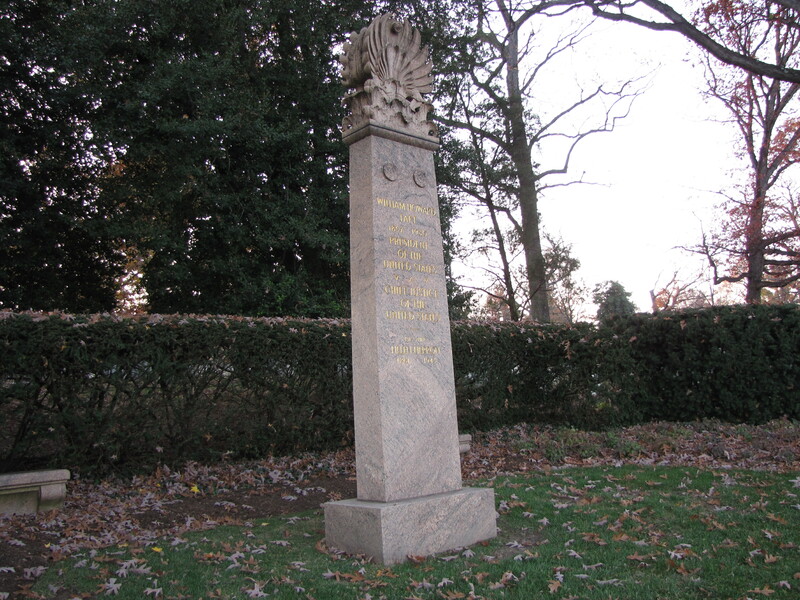 The elegant 14 and a half foot tall Stony Creek granite monument designed by James Earl Frazer marks the graves of United States President William Howard Taft and his wife and First Lady, Helen Herron Taft. Gold lettering states their names on the marker. The Greek Stele (stone or wooden slab generally taller than it is wide and designed as a funeral commemorative) is topped with a acroterion motif–a stylized palm leaf, that can be found on classical Roman and Greek architecture. This motif has its origins in Egyptian art and architecture. Taft was born into a prominent family of Ohio politicians, and was an accomplished public servant who honorably served the country for over 50 years; the only person in American history to serve in the two most powerful postions in the United States government, as president and as Chief Justice of the Supreme Court.